HQ Trivia allows people to live that dream — without auditioning for a TV show. HQ is a trivia game app where users log on to play twice a day — at 3:00 PM and 9:00 PM — for a chance to win real prize money. Unlike game shows where there are two to four contestants, HQ lets hundreds of thousands or even millions of people play at once. The way the game is set up to limit when users can play is at the heart of what's made this app so popular. Add to this a referral program that gives players extra lives to keep playing and you have an app designed to keep people coming back and referring friends to increase their chances of winning. HQ is still fairly new, but it's managed to carve out a niche for itself by adding in addictive elements. For example, because people want to win, they form teams with people they know in the hopes that with more people playing together, the more likely they are to know the right answer. 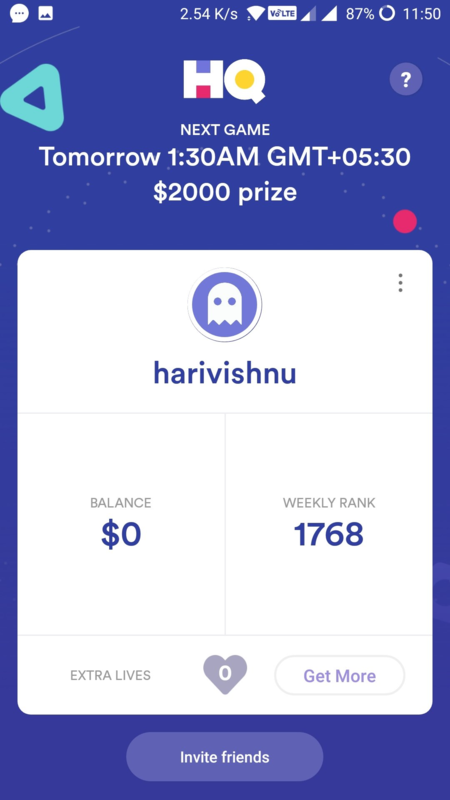 With this organic need for group participation, it's no wonder that HQ saw an opportunity to incentivize the game and add a referral program. Here's how the program works and why it's doing such a good job of attracting new users daily. Let's take a closer look at the referral program and what makes it so appealing and why it's doing well. When a user gets a question wrong in HQ, they're out. No second chances. Unless you happen to have an extra life. If a user happens to have an extra life, they get another chance to continue towards the grand prize. To get that extra life, users have to share their referral code. When new users sign up using a current user's referral code, the current user gets extra lives. The more referred friends a user gets, the more free lives they collect. If a user gets one answer wrong in HQ, they have to wait until the next game to try again. The frustration this causes is at the core of the referral behavior. Users want to conquer the game and will use an extra life to make sure they have a chance at that. HQ is inherently social because it's live. Users don't play HQ alone while they're waiting for the train. They play HQ at 3 pm and 9 pm, which means they'll likely be at the office, at home or out with friends when they play it. The internet is full of videos and pictures of people playing while at different events and going crazy when they win — even if it's just a little over eleven dollars. When other people see this excitement, it builds the hype surrounding the game. It's new and different from anything they've played before. 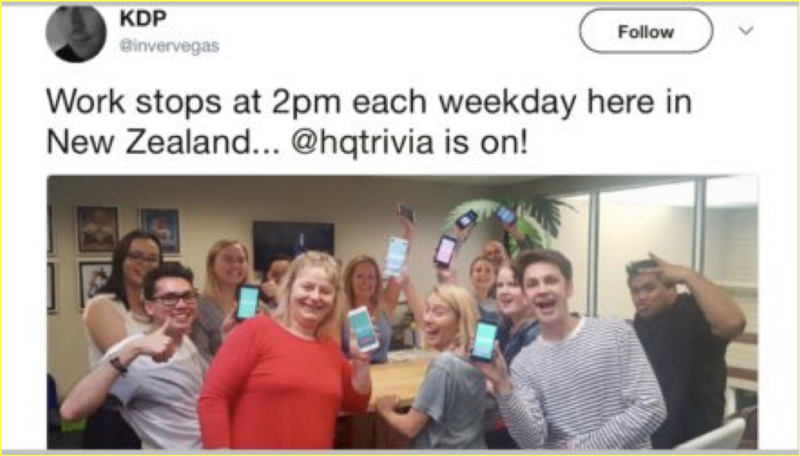 This intrigue has helped HQ become a naturally social phenomenon and, with the referral added, it's helped the app's user base grow even more. The heart at the bottom of the screen tells users how many extra lives they have. By clicking on “Get More,” users can share their referral code with their network. This approach works because, by having the code occupy prime visual real estate in the app, it keeps the benefit of referring people top of mind. 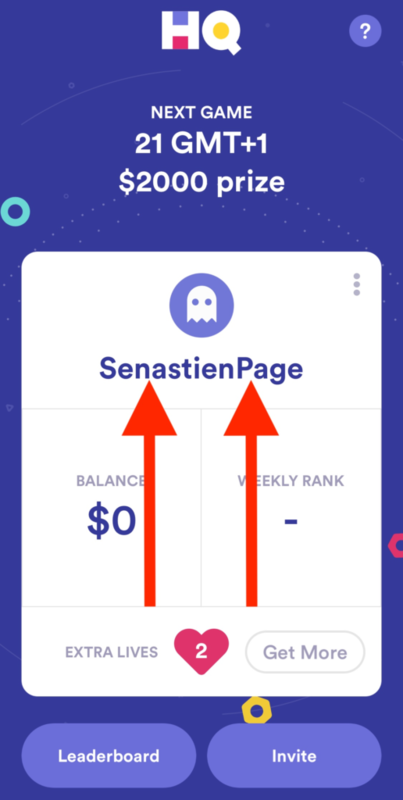 In addition to this, HQ users can post their referral code on social media, on YouTube with just a video of their code, and add it to blogs or anywhere they spend time online. The codes are easy to remember, which also makes them highly shareable. Once just before a new game is about to start, to get users to refer-a-friend and get a free life in time for the game. Getting extra lives before a new game starts is extremely valuable because players go into the game with more confidence that they have a better chance of winning. These notifications help HQ because they potentially have even more players signing in to play the next game. Throughout the day, to keep the anticipation and excitement about the game ongoing. There's even some research that shows which times users are most active on the app. 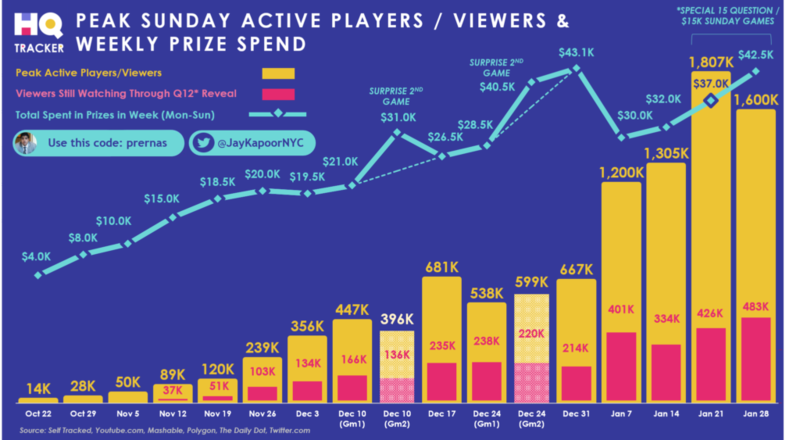 Sunday stands out as one of the peak days to play HQ. Here we see that, over time, the number of Sunday players has steadily increased with the number of users who don't make it to the final question but stick around anyway, also increasing— granted, at a much slower pace. As a side note, this is also a creative way to share a referral code. Notice above the data, there's the author's personal HQ referral code. People interested in the data he's shared will be compelled to use his code to try out the app for themselves, thereby giving him extra lives at the same time. With user participation, the goal is to make it as easy as possible for advocates to share their referral code. For example, you can put the request to refer-a-friend in different parts of your product or website, send email reminders to refer-a-friend or add a callout in places where users spend the most time — like a homepage or dashboard. 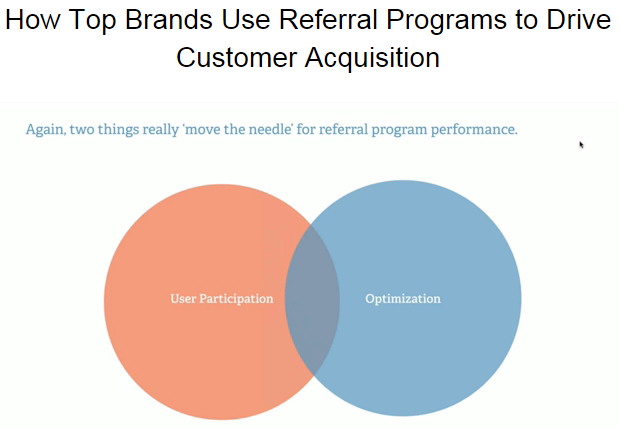 Next, successful referral programs are optimized when the program is easy to understand, access, and includes an offer that resonates with users. The more in line the referral offer is with how advocates use the product and encourages them to keep using the product, the more successful it'll be. HQ has found the sweet spot — where user participation and optimization overlap — and has come up with a referral program that makes it easier to achieve exponential growth. Here are the four main takeaways we've learned from this program. It's become a running joke for people to take pics of themselves playing HQ at important events — like at weddings, basketball games, during vacation or even at work. This speaks to how quickly HQ has become a part of daily social activities. People are so eager to play it, that once it's quiz time, they're going to play — no matter where they are. One way to encourage this type of behavior and grow customer acquisition is to create your own hashtag or share images of users playing together on your social channels. This provides even more social proof for new users who might be on the fence about using the app. The fear of missing out — FOMO — kicks in and app downloads go up. Because of the viral nature of social media, use it to get in front of new users and grow your following. Once you have their attention, give them glimpses of people using your app and their reactions to it. This goes further than testimonials because it shows your app in action. Users understand the value of referral codes and do their best to attract more referred users. 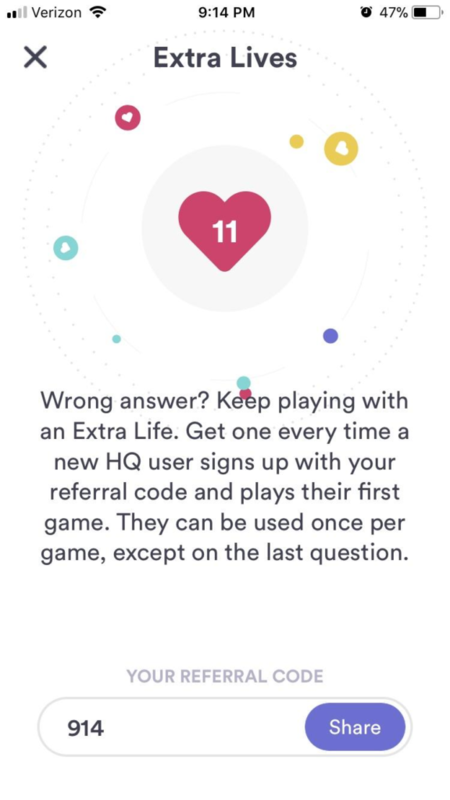 The downside to this is that users want so badly to get a chance at getting an extra life that they've found a way to do it without using a referral code. Users just have to swipe up on the dashboard to circumvent the system. This workaround is all over the internet so what HQ can do is update the UI to prevent this from happening. At the end of the day, users are still playing, but the point of the free lives is the refer-a-friend feature helping to grow the user base. Listen to how your users use your app and you can either support their actions or put in place measures that get them to use it the way the app is intended. Use social media or social forums to stay close to what users are saying about your product and for hints on how they use it. What's great about HQ's referral program is that it's set up to get players to naturally share their referral code. The game is designed to make people eager to play — they can only play twice a day at set times. And when the game finally does start, players want to win something even if the pot is small. By layering referrals on top of this, HQ uses the natural dynamic of the game to get players to refer friends. For a better chance of winning, players need an extra life and to get an extra life they need to refer-a-friend. As a result, players are more than willing to refer people because they get immediate gratification. Map out how your app works and design it so there is only one way to use it. This way, if referrals are the only way to get more out of the app, then users will be more willing to share it with other people. Just like HQ, you can have built-in anticipation so users will want to come back and play. Because of the nature of the app, millennials are the biggest HQ user group. The app has basically taken the concept of traditional game shows and repackaged the idea to cater to a new audience. To keep this audience engaged, many of the trivia questions focus on pop culture and current affairs — topics that millennials feel comfortable answering. To boost audience awareness of the app, HQ uses influencers. This gives the app extra credibility and widens their reach. This is especially important for a new app. HQ recently partnered with Dwayne “The Rock” Johnson to give away a whopping $300,000 grand prize. The promo ran in conjunction with other promotions for the movie Rampage and it got a lot of attention — considering the minimum prize is usually around $2,500. As you get to know your audience more, you'll get a better sense of the types of influencers that resonate with them. Set a goal to partner with one or two a month to keep your product visible and your promotion spread across your target audience. Will your referral program be the next big thing? HQ's referral program is refreshing because it's so different from a lot of the popular programs out there. HQ has figured out what their product's Aha! moment is and created a program that gets people to experience this moment consistently. Figure out what that moment is for your product and get creative with the offering. Remember, there's no standard formula for your referral program. What's important is that it's in line with how you expect people to use your app and it's easy to share. Get this right and your referral program could very well be the next big thing.